Some professionals thrive on diversity — just ask Kinta Turner. Kinta spent more than 10 years managing two simultaneous careers that catered to her broad range of interests: corporate operations and management for companies like Cisco, Auto Plus and Mars Food, as well as public relations work for artists in the music industry. Today, she’s found a way to blend elements of each field into her role as owner and transformational coach for The Freedom Factor. Based in Los Angeles, this management consulting firm has allowed Kinta to apply lessons from her own unique journey to helping others achieve their life goals. Kinta decided to put her consulting career in motion by seeking out her third college degree, and first master’s. After researching different options for online graduate education, she was inspired by the topics covered in the online Master of Professional Studies in Strategic Public Relations program from George Washington University –– especially the curriculum focused on social responsibility. It wasn’t just the education that Kinta felt empowered by, but also the way in which the online learning platform presented opportunities to engage with others in the program. As someone who thrives on collaboration, being able to build strong relationships with her instructors and peers helped round out the kind of education she was looking for while preparing for her future as a consultant. 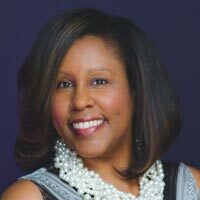 Change can be a great thing, and for Kinta Turner, taking a chance on a new career path has helped her channel the favorite elements of her professional life into a rewarding advocacy role. As someone who had a clear end goal in mind and made it happen, she encourages others to take the time to develop an action plan for their own professional goals.